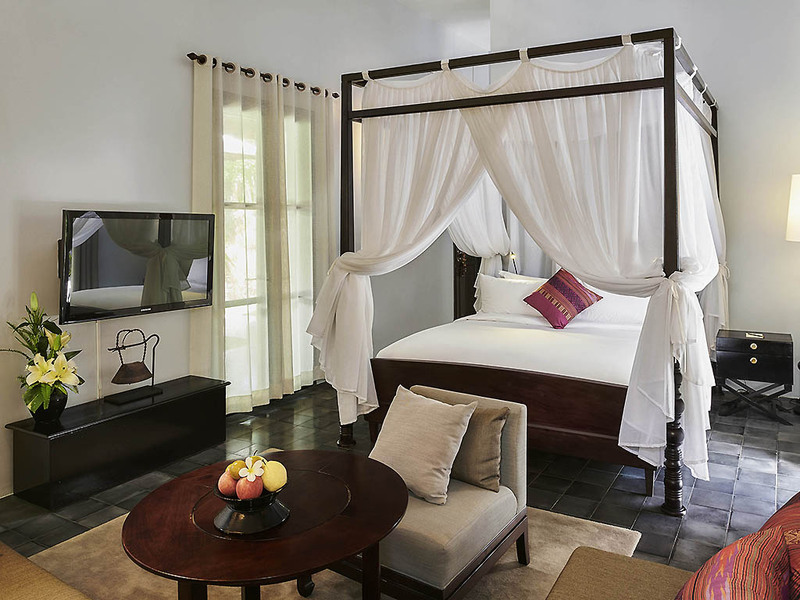 Enjoy a privileged stay in a century-old colonial mansion enclosing lush botanical gardens. Built in the 1900s as the governor's residence, this stunning demeure, with its fortified walls, was transformed into a luxury all-suite Sofitel in 2016. Embrace local culture as you explore a city that seems untouched by the passage of time. Once referred to as 'the Refuge of the Last Dreamers', Luang Prabang is a colorful patchwork of villages, temples and cultures. The hotel reflects the shared identity and timeless appeal of its destination. Lao tradition, and French elegance and hospitality are woven together in style, inviting you into a world where time slows down and luxurious old-world nostalgia prevails. Each Sofitel is a unique blend of the French art de vivre and local refinement. Discover timeless elegance with a distinctly modern feel in this landmark colonial mansion that was built in the early 1900s to house the French governor. Luang Prabang, once a royal capital, recently celebrated its 20th anniversary as a UNESCO World Heritage destination. The hotel is likewise steeped in history. 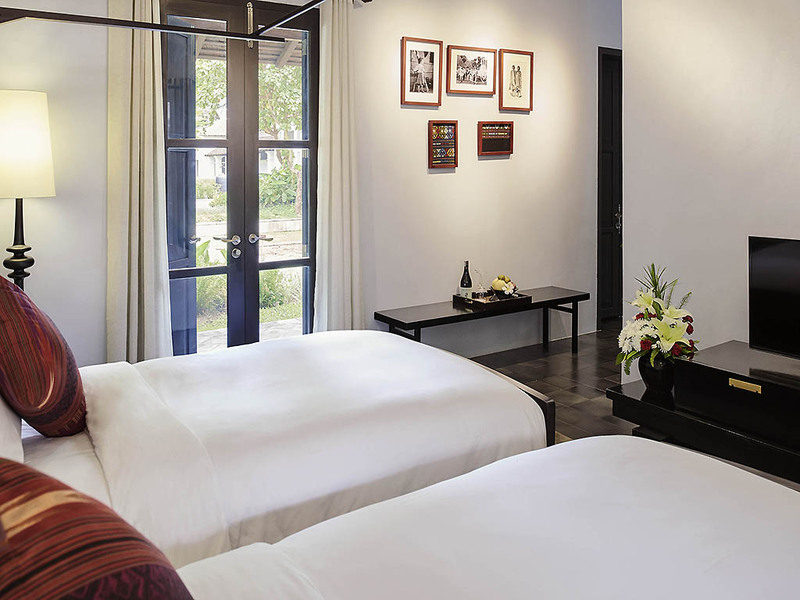 Fully restored in 2015, Sofitel Luang Prabang is one of the oldest hotels in the collection. With high fortified walls, watchtowers, manicured gardens and a sparkling amethyst-tiled pool, the hotel embodies French sophistication and Old World romance. It is a refuge for dreamers who wish to soak up local culture in a heavenly setting. Aspects of local tradition and design can be found throughout the stunning building, from the refined décor and world-class cuisine (voted best in Laos) to unique 'blind massages' in Le SPA. Discover what makes life so magnifique in Luang Prabang. A UNESCO World Heritage Site idyllically set at the confluence of the Nam Khan and Mekong rivers, the historic royal capital of Luang Prabang features glistening temples, historic French provincial architecture and gracious residents. Sofitel Luang Prabang is only a 20-minute drive along Route 13 from Luang Prabang International Airport in the peaceful Ban Mano quarter of the city. 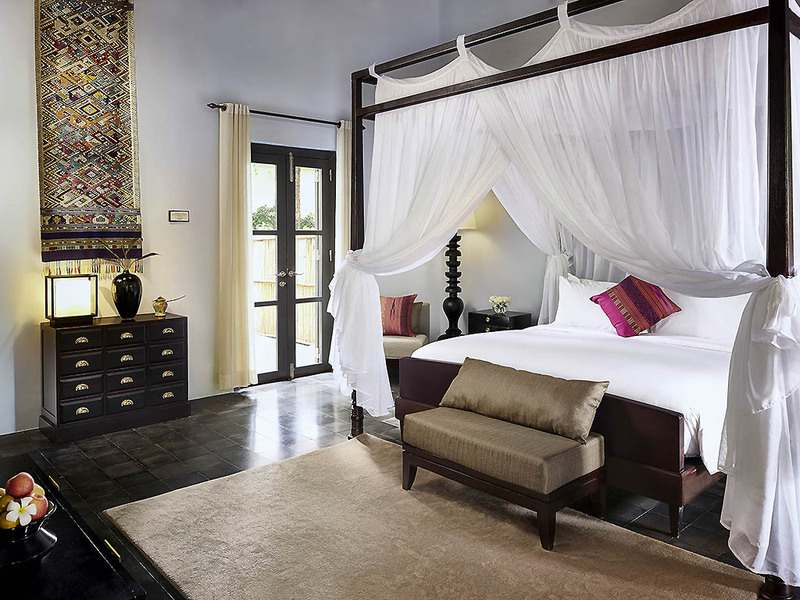 The spacious Superior Garden Suite with a King bed is 55 m² (592 sq.ft. ), exquisitely decorated with Lao silk and artifacts, opens into a garden with outdoor gazebo and bathtub. Bathrooms offer rain shower, indoor bathtub, and dressing area. The Garden Suite with 2 Twin beds is 45 m² (484 sq.ft. ), exquisitely decorated with Lao silk and artifacts, opens into a garden with outdoor gazebo and bathtub. Bathrooms offer rain shower, indoor bathtub, and dressing area. Signature Governor's Residence is 120 m² (1,300 sq.ft.) with 1 King bed and 2 Twin beds. Distinctive and grand, features high ceilings, generous sitting and dressing areas, expansive garden with outdoor gazebo and bathtub. Discover distinctive spices and flavors of traditional Lao cuisine and savor delicious Western fare at the Governor's Grill steakhouse restaurant. Dine al fresco under the safari tent overlooking the botanical garden or in the intimate indoor dining room. The Governor's Grill Bar serves an unparalleled selection of fine wines, spirits and locally-inspired cocktails. It is an intimate venue for a tête-à-tête with loved ones, an informal chat with colleagues or simply some quiet time alone. The inspiring surroundings of Sofitel Luang Prabang make it an idyllic setting for corporate events and meetings. Where better to clear your mind of all interferences and focus on the task at hand than this haven of peace and tranquility? Our boardroom and lounge, Kaipen, is thoughtfully designed and can accommodate up to 70 people. For larger events and family celebrations, the Garden hosts around 200 people. Sofitel's impeccable service and savoir faire make your wedding, gala or sophisticated dinner party an event to remember forever. 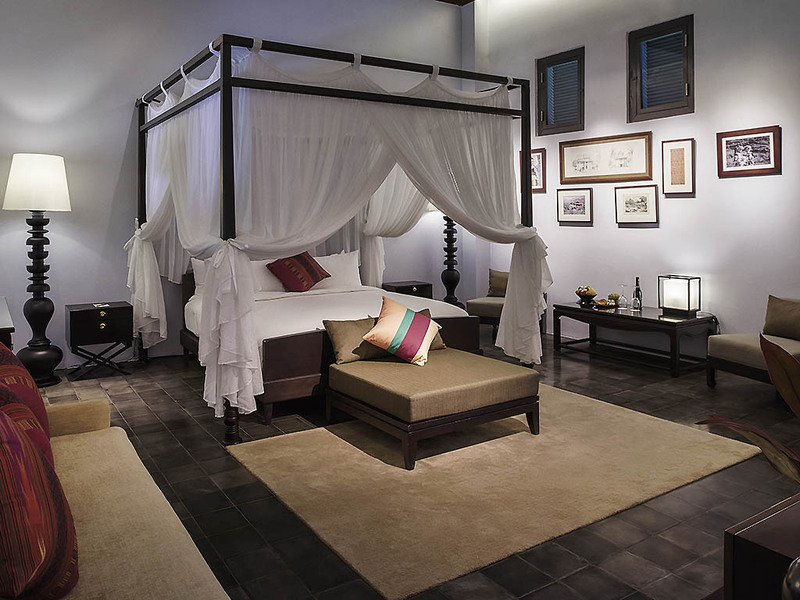 Sofitel Luang Prabang is a sumptuous setting for newlywed bliss. 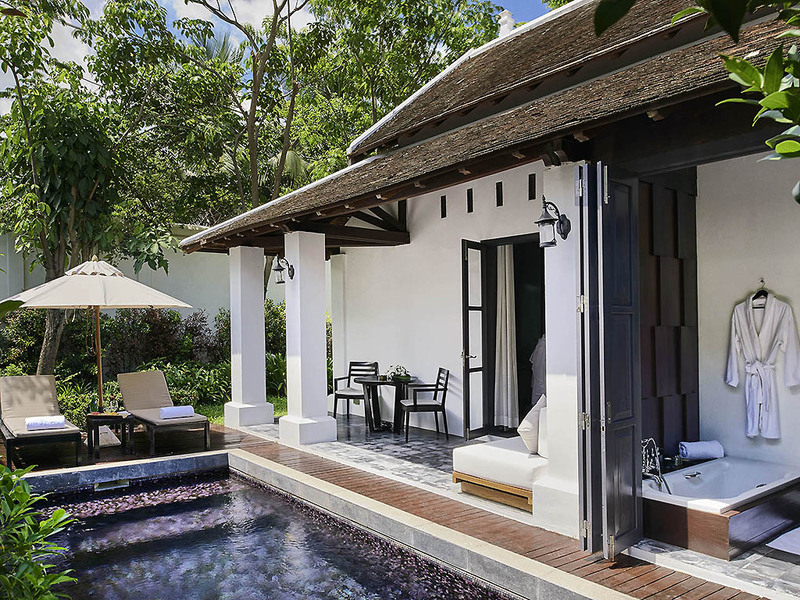 Surrounded by lush tropical gardens, this poetic refuge is perfect for long, romantic tête-à-tête. Our staff love nothing more than treating honeymooners to the stay of their lifetime. Our cheerful team and Leisure Concierge are on hand to provide you with everything you need for an extraordinary stay in Luang Prabang. Pillow menus and bathtime treats soothe the senses while free WiFi keeps you connected to the world outside. Discover the enchanting town of Luang Prabang through various tailor made activities that will leave you mesmerized. Let me help you create the perfect journey with anything you wish for from Mekong sunset cruises to culinary cooking. Travel in comfort with a range of fleets from vans to SUV at USD 25 per round trip. Dive into refreshment in the Olympic-size swimming pool that takes pride of place in the beautifully landscaped garden. Or sip cocktails in the shade of an elegant parasol as the sun dances across the underwater mosaic of amethyst-blue tiles.